We will have a PQA+ Adult producer training at 9 am and TQA Adult training at 10:30am in Donalsonville, Ga at the Adult learning Center , on Wednesday Feb 8. Dr. Robert Dove , UGA Animal Science , will be here to teach these sessions. Please call or email us if you would like to participate. Travel South on Hwy 91 from Colquitt, GA to Donalsonville, GA , turn left onto Martin Luther King, Jr. Drive, go to 4-Way Stop, turn north onto N. Friendship Ave. (Friendship Cemetery will be on the North-East corner) go 1 block to 426 Friendship Ave. (Brick building on Left across from Cemetery. Wheat has grown very well this year where it has adequate fertility and moisture. 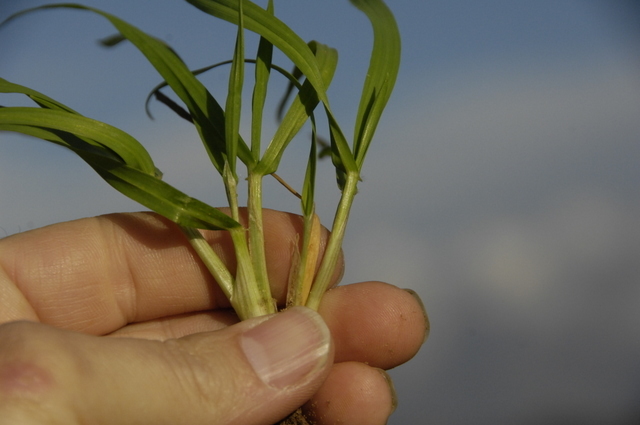 Now’s the time to count tillers per square foot to make sure we have plenty out there because tillers = heads of wheat . Most of our wheat is drilled in 7.5 inch rows so just measure 19 inches down and count tillers. We want 80 to 100 tillers per square foot, and if we don’t have that now , it would be good to go ahead with an early split sidedress Nitrogen application. And then come back in mid February with the rest of your nitrogen. If you have plenty of tillers then you can just wait until the 2nd week of February to put all your sidedress N out. This well tillered plant has 5 tillers that will grow grain. 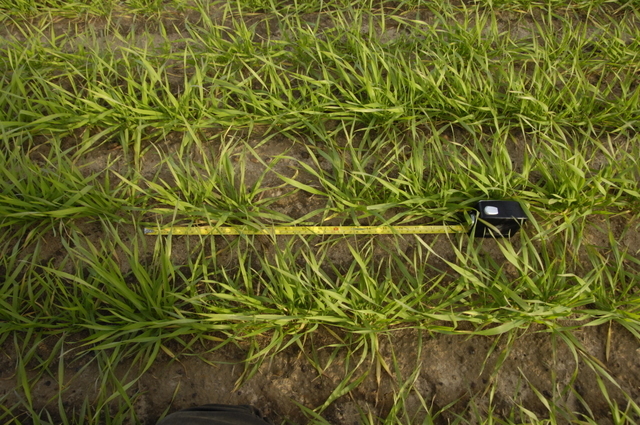 Count the number of tillers in 19 inches down the row if your row spacing is 7.5 inches. Aphids in fields I’ve been looking at are low in number, but increasing. 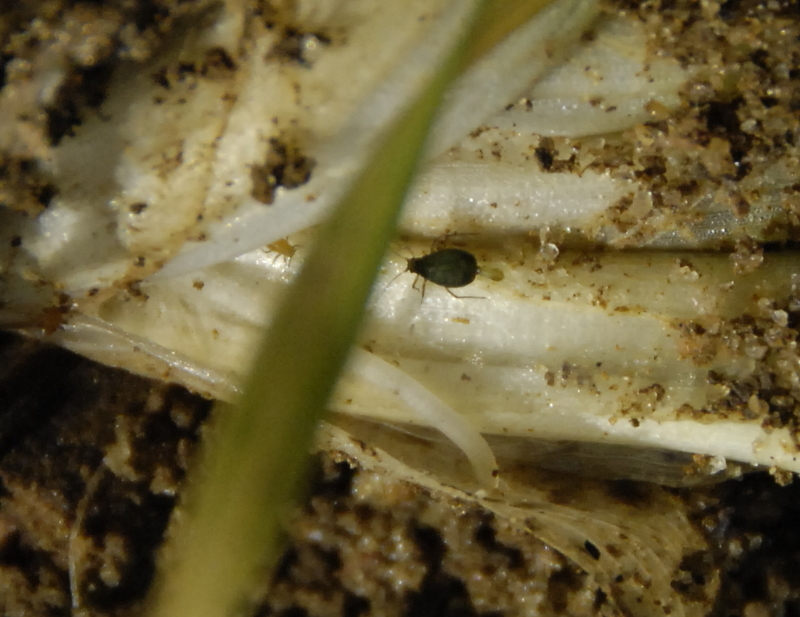 Yesterday we saw a good many aphids in wheat fields that had been parasitized by tiny wasps and were taken out of commission. 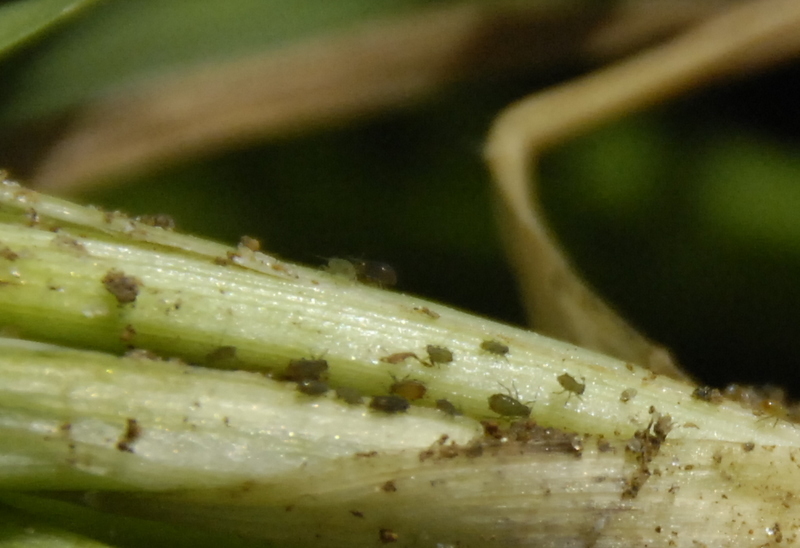 Aphids can be a real problem in wheat due to the fact that they transmit Barley Yellow Dwarf disease besides the fact that they damage the plant through direct feeding. We need to be scouting our fields to evaluate aphid levels. Here’s some info from the UGA Pest Control Handbook. Soft/Hard Dough stages (Do not treat). Here's the female aphid giving birth, yes they have live young and are prolific, they reproduce faster than any other insect. Yes, Mistletoe is good and bad. Good for kisses and bad for trees. I get questions a good bit about mistletoe in trees and if it hurts them. One of my fellow north Georgia county agents, Paul Pugliese, wrote the following article about mistletoe. Mistletoe is often used postmortem to lure unsuspecting sweethearts to a Christmastime kiss. For the other 364 days of the year, it is actually considered an infectious parasite that kills trees. If you see green leaves in the top of deciduous trees, it might be mistletoe. Mistletoe is an evergreen, parasitic plant found on a wide host of trees, including alder, birch, cottonwood, maple, oak, hickory and elm. 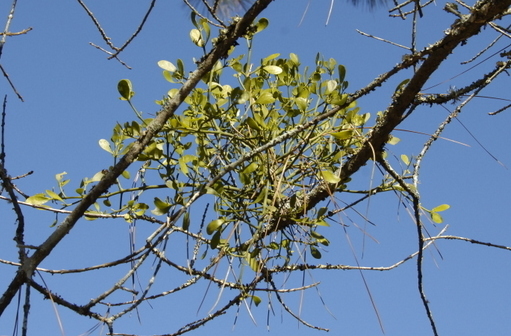 Mistletoe gets water and nutrients from the host tree, but it is not totally dependent. Leaves of mistletoe contain chlorophyll and are capable of making their own food from carbon dioxide and water. Birds feed on mistletoe berries and deposit them on new trees in their droppings. This is how mistletoe spreads from tree to tree. When the seeds germinate, they grow through the bark and into the vascular system of the host where it obtains water and minerals. Mistletoe can be particularly stressful to trees during drought conditions. Trees that are heavily infested by mistletoe for several years may lose vigor, become stunted or even killed. This is especially true if the tree is already subjected to drought stress, harsh winter conditions, construction injury, diseases, insects or other conditions that further weaken the tree. Mistletoe grows slowly at first and may take years to produce seeds. Healthy trees can tolerate small mistletoe infestations, but individual branches might be compromised and susceptible to wind or snow breakage. Simply removing mistletoe will provide some protection from spreading. However, if you remove only the mistletoe, it will probably regrow. To effectively control mistletoe, prune the tree one to two feet beyond the point of attachment. If the mistletoe is located on a main limb or trunk, remove the top of the mistletoe and wrap the cut with an opaque plastic to prevent sunlight. Since mistletoe requires light, it will die within a couple of years. It might be necessary to repeat this treatment, especially if the wrapping becomes detached or the mistletoe is not completely killed. This week I want to ask about this photo. What is going on in this field a farmer called me to look at yesterday where he had recently planted an oat cover crop that was up about an inch tall? After hearing 3 good climate talks lately, I think I finally got it. La Nina, low ocean temperatures in the Pacific, means a good possibility of higher temperatures and drier for us in winter and spring, and El Nino the opposite. Neither mean anything for weather past the end of May. 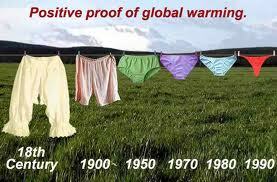 Melissa shared a graphic similar to this one explaining proof of global warming and she said it may also be related to a reduced demand for cotton. lol. Last week’s question concerned a photo and it was a manatee in a spring run in Central Florida, Orange City, just off the St Johns river. Florida County Agent Doug Mayo answered it pretty quickly. Yes, they come up into the springs in the winter when it gets cold. 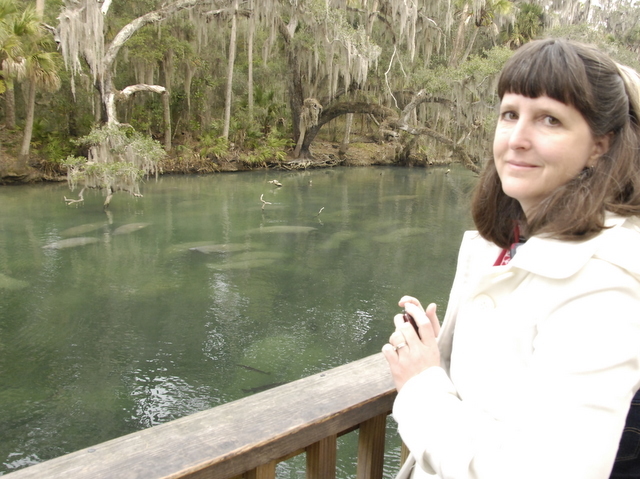 The spring here was a constant 72 degrees F. It was amazing that hundreds of wild manatees were in this spring run. Out at the edge of the river we could see them swimming into the St Johns. It was flowing backwards to most rivers I’ve ever seen, the Saint Johns flows north. You could see signs of their encounters with boats and propellers, too. 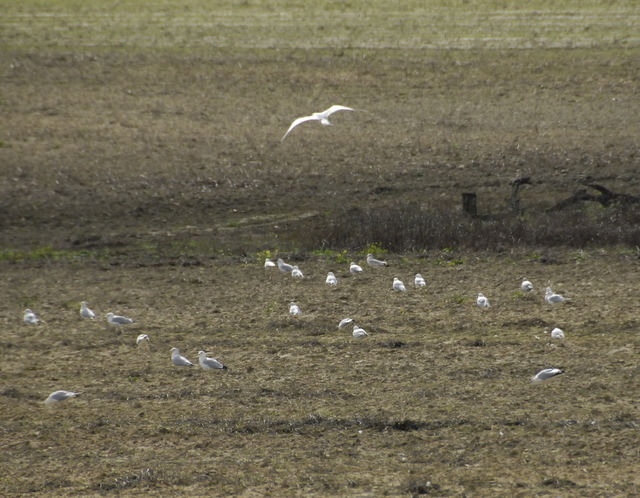 There were several with young. They eat about 100 pounds of aquatic plants a day. If we had about a thousand in Lake Seminole they could do some work on the weeds there. Adults are typically 9-10 feet long and weigh around 1000 pounds. However, they may grow to over 13 feet and weigh more than 3500 pounds. Adults are gray in color, with very sparse fine hairs distributed over much of the body. Stiff whiskers grow around the face and lips. Algae growing on the dermis may make them appear green or brown. They have two fore limbs, usually with 3 or 4 nails, that they use for slow movements and to grasp vegetation while eating. They have a rounded flattened tail for swimming. The nostrils, located on the upper surface of the snout, tightly close with valves when underwater. While they can hold their breath for up to 20 minutes they typically surface to breathe approximately every 3-5 minutes. Their eyes are small and have a membrane that can be drawn over them for protection. The ear openings, located just behind the eyes, are small and lack external lobes. They have a flexible upper lip that is used to draw food into the mouth. The manatee is a large, herbivorous, aquatic mammal that inhabits coastal waters and rivers. The West Indian manatee’s range is from the southern United States throughout the Caribbean Islands, Central America, and to northern South America. In the United States the manatee ranges up the eastern coastline into Georgia, the Carolinas, and beyond during warm months. In the Gulf they are occasionally sighted as far west as Texas. 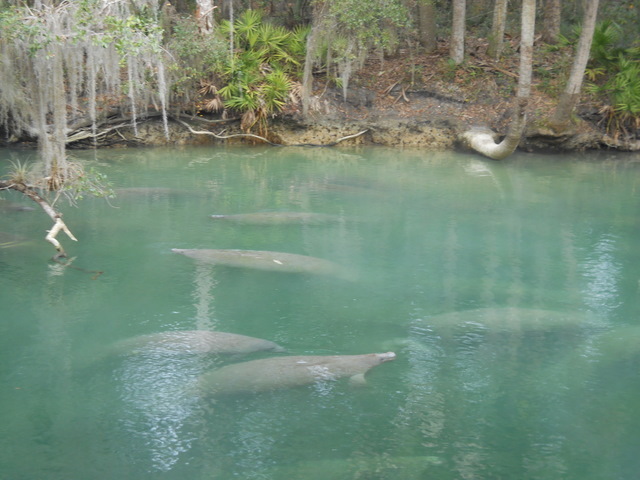 During cold months manatees in the southern United States migrate to the warm waters of south Florida, or find a source of warm water such as artesian springs or industrial discharges. They consume freshwater and marine plants of all kinds. Gestation is approximately 13 months and usually one calf is born. The calf may stay with the cow for up to 2 years. Manatees reach sexual maturity in 3-5 years and may live over 50 years. A manatee uses its flippers and tail to steer itself through the water and moves its tail up and down to propel itself forward. Manatees are quite agile in the water. They can swim upside down, roll, do somersaults or move vertically in the water. Manatees are mammals. They must surface approximately every five minutes to breathe, but can hold their breath for as long as twenty minutes when resting. The manatee’s nose is usually the only part of its body that comes out of the water when it breathes. Manatees are herbivores, which means they eat plants. Also known as a “sea cow,” manatees usually spend up to eight hours a day grazing on seagrasses and other aquatic plants. 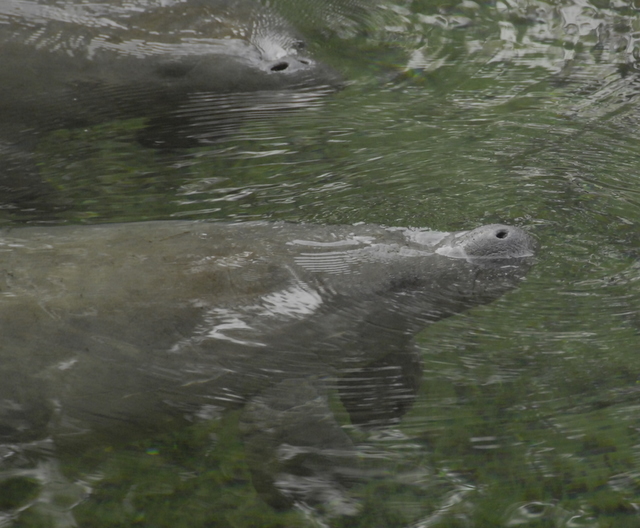 A manatee can consume up to 10 percent of its body weight in aquatic vegetation daily. The manatee uses its muscular lips to tear plants much like an elephant uses its trunk. Manatees rest from 2 to 12 hours a day either suspended near the water’s surface or lying on the bottom, usually for several hours at a time. This week's question: What is this and is it bad or good? from Lindsay, Reinke, T‐L, Valley, Nelson and Senninger. Plus you can enjoy a sponsored lunch! Please contact them below by Feb 15 to register. 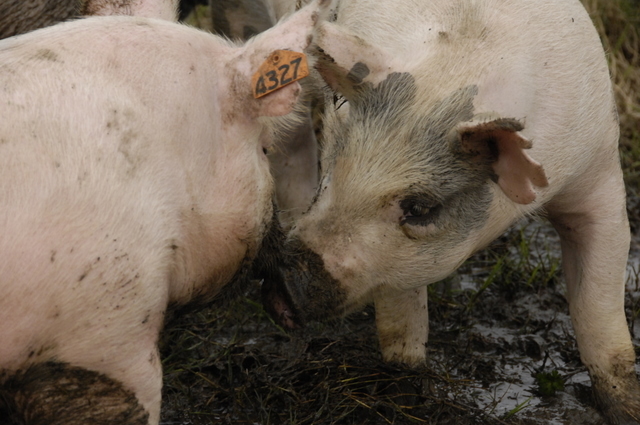 Muddy pigs were a welcome sight this week. We are thankful for the good rain of almost 2 inches for most of Seminole County. 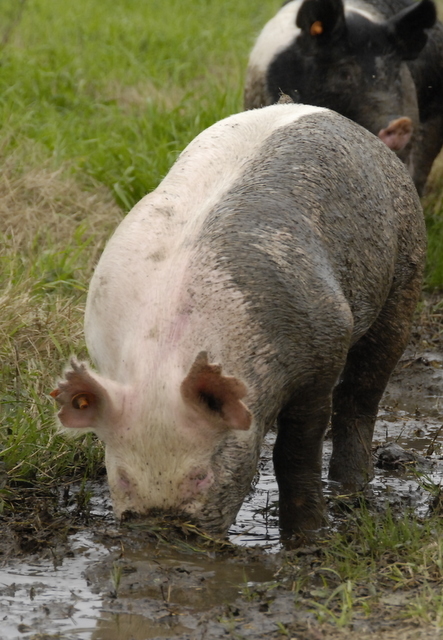 The kids were walking our 4-H show pigs and they loved the mud to roll in. USGS Streamflow map shows how low the streamflows are in Georgia. Red and Burgundy 10 % of normal flow or lower. Drought Map shows how critical the drought is across the US. 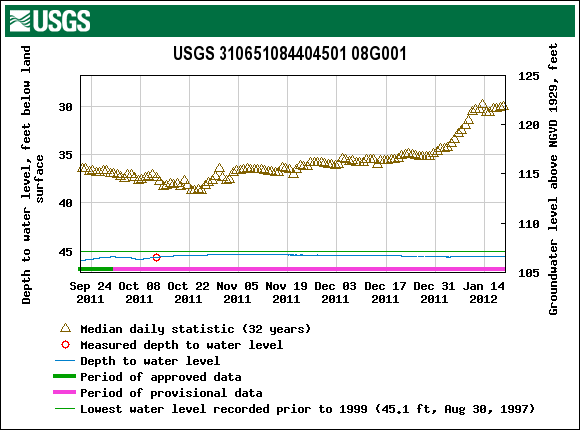 The USGS Groundwater graph shows that normally we get an increase in the groundwater level this time of year, shown by the gold triangles (32 year average depths to water). Our current level (blue line)is staying at about 46 feet down, that’s about 16 feet lower than normal for this time of year. We need to pray for good slow rains here and north of here. Does that get your Goat? Here’s Justin Burke with his pair of day-old spanish goat twins. Goats were among the first animals domesticated by humans. Worldwide, more people eat goat meat and dairy products than the meat and dairy products of any other animal. Goats have proven to be an enduring source of tasty, low-fat meat and high-calorie milk for people in some of the globe’s harshest climates. However, in the United States goat consumption is just beginning to take off. Experts estimate that there are more than 3 million goats in the U.S. today. They fall into three categories: meat, dairy and angora. Popular breeds include: Boer, Kiko, Spanish Meat Goat, and Tennessee Fainting Goat (meat); Alpine, LaMancha, Nigerian Dwarf, and Nubian (dairy); and Angora and Pygora (angora). There are also Kinder goats which are used for both dairy and meat, and Pygmy goats that are mainly used for pets. The largest segment of goat production in the U.S. is the meat goat segment. There are an estimated 2.6 million meat goats in the U.S. Most of them live in Texas, but Georgia has the fourth-largest goat population east of the Mississippi River. The growing Chicano and Latino populations in the Southeastern United States and in Texas have brought with them a historical preference for goat meat, also known as chevon. And this cultural preference has turned into to big business for those producers who can meet this steadily increasing demand for goat products. The Spanish meat goat — also called the brush or briar goat — is of uncertain origin. The population probably consists of goats brought into Colonial America that migrated west with their owners and bred with goats from Spain and Mexico. Later, dairy breeds and Angoras intermingled throughout the population. Spanish goats come in a variety of colors and patterns; most are horned. (Polledness in goats is genetically associated with an undesirable reproductive condition.) Their size is variable depending on location. Mature brush goats in Georgia are smaller than their Texas counterparts. Spanish bucks in Georgia weigh 80 to 120 pounds with does (nannies) weighing 60 to 80 pounds. Bucks (billies) from Texas can weigh up to 200 pounds and does up to 130 pounds. This is probably a reflection of nutritional value of forage. Georgia brush goats have been selected over the years for survival of the fittest, with some selection pressure placed on color, horns and size. Selection for survival has led to small, light-milking, adaptable goats mainly because a small animal can meet its nutritional needs more easily than a large one. The introduction of the South African Boer Goat and the Kiko from New Zealand in the early to mid-1990s provided producers a new source of germplasm. This heavily muscled, well-tempered goat has become quite popular since its importation in 1993. Research indicates that using partial or full-blood Boer billies increases the size, muscle and growth rate of the kid crop. The effect of the Boer on the resulting females should be to increase the size, muscle and milk production; however, research to document the Boer female’s reproductive efficiency has not been conducted. The importation of the Kiko, a New Zealand breed selected for survival and growth rate is also likely to improve meat goat production. The Kiko is a large-framed, early-maturing goat with high feed conversion rates. They may be more tolerant of internal parasite loads. Crossing Kiko or Boer with other breeds should result in increased heterosis or hybrid vigor. Very few Angora goats are used for meat in Georgia. A commonly repeated story which tries to explain this phrase’s origin is that goats were placed with racehorses to keep them calm. When a bad guy who wanted the horse to race badly removed it, they ‘got someone’s goat’, the horse became unsettled and ran badly. The 2012 Southeast Hay Convention will be valuable to serious hay producers who seek to learn more about modern hay-making techniques. 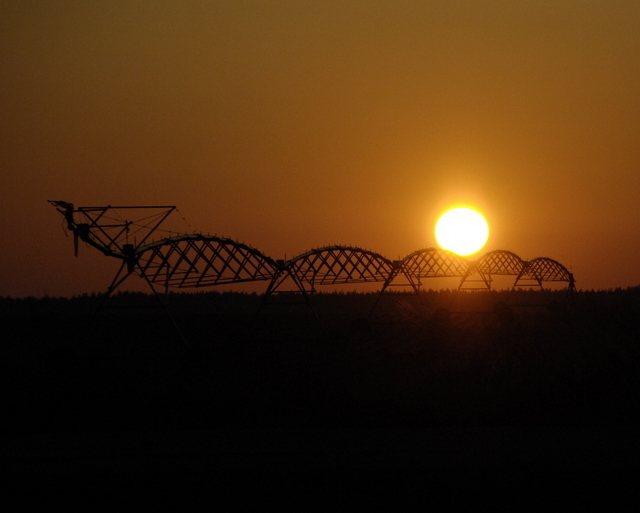 This program is dedicated to those who are serious about commercial hay production and those who would like a thorough, “A to Z coverage” of the subject. We pride ourselves in the fact that this training is unique in the Southeast, as it is essentially the only program of its kind. Below is an outline of the major topics that will be covered. Early-bird registration for the Southeast Hay Convention is $170 for the first person from a family or farm. Additional persons from the same family or farm are $100. Included in your registration fee is a 400+ pg. Southeast Hay Convention notebook, a weed ID book, two lunches, freshments, and other resourses. Registration for the Southeast Hay Convention is available online by clicking here. You can also download this printable form, fill it out and mail or fax it to the Conference Office.